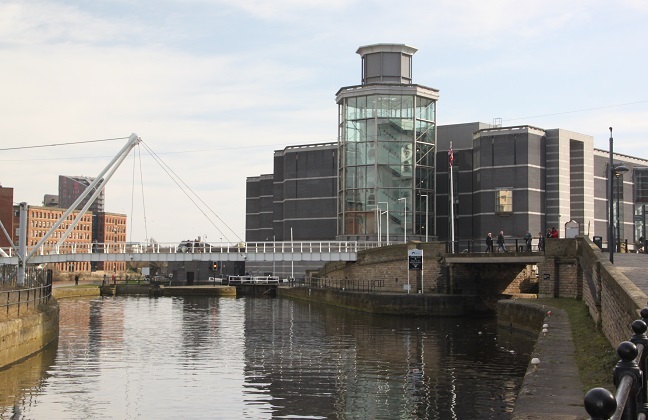 Keen to shake off the post Christmas lethargy but hampered by all the rain we’ve been having, we decided to head for Leeds and spent a day indoors at the Royal Armouries, Britain’s National Museum of arms and armour. Apparently this is one of the most important museums of its type in the world. Having heard great things about it in the past – especially the outdoor jousting events – we always intended to visit, just never got around to it. Now cutbacks and all that mean no more outdoor displays and spectaculars, however the museum itself is still free and (we reckoned) worth a look. 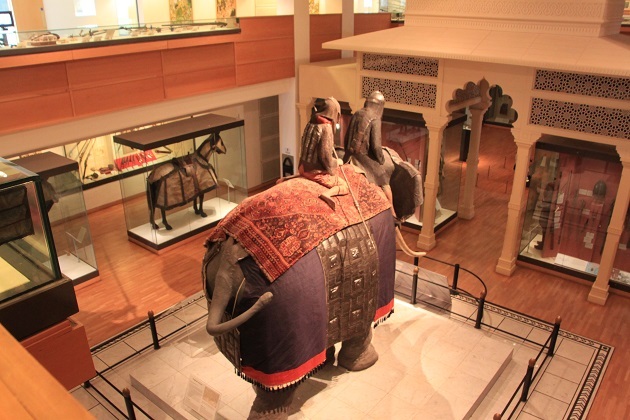 The museum in Leeds is big – spread over 5 floors with over 8,500 items on display. 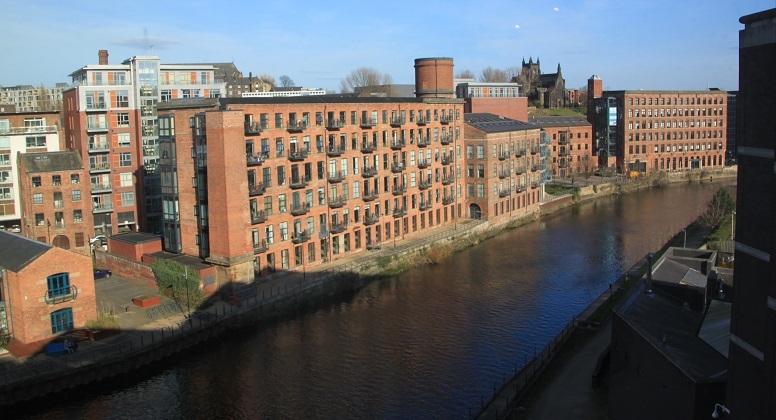 Easy to find, we followed the multitude of signs and enjoyed a pleasant walk along the canal to Clarence Dock. 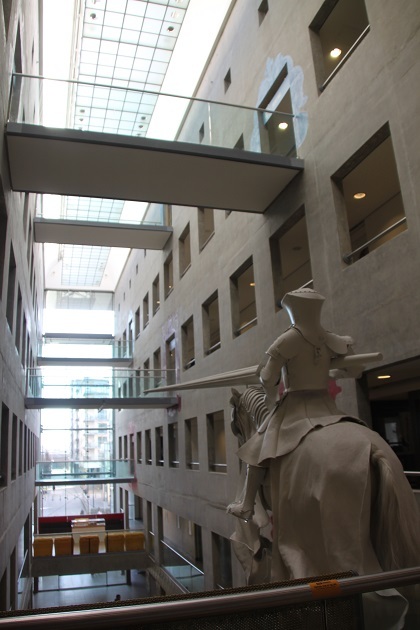 The outside was not at all what I expected – all modern, steel and glass and more office block than museum but we ventured inside. 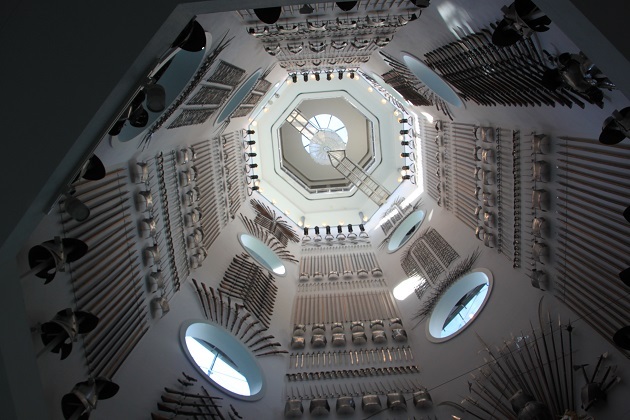 So bright and incredibly spacious, the sense of space is intentional to ensure the ceiling heights could accommodate even the largest weapons in the collection when displayed vertically. A small issue at arrival, there were lockers but these were sealed and a notice advised that due to security precautions they were not available. We had to carry coats and baggage around with us – not ideal as it was freezing cold outside but warm inside, still a reflection of these times and better safe than sorry. 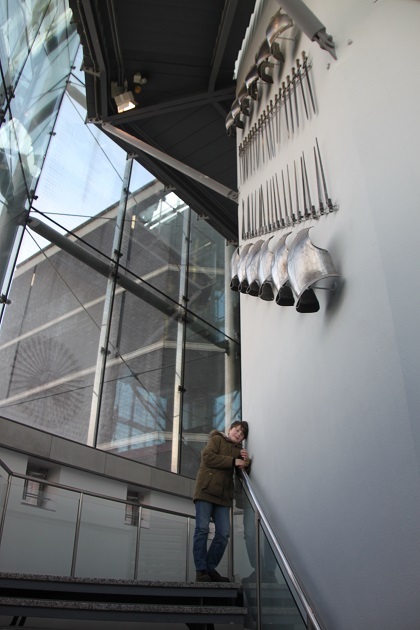 First stop was the Hall of Steel – inside the spiral staircase and all glass so you get great views over the docks. 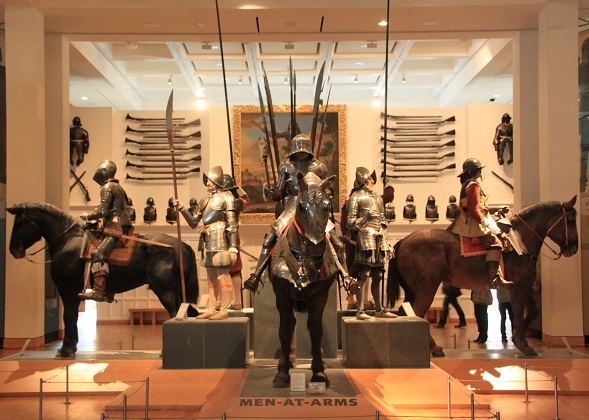 It is also open to roof level with 3,000 items of 17th century armour and 19th century military equipment displayed on the walls. Spectacular and very artistic, we were seriously impressed. 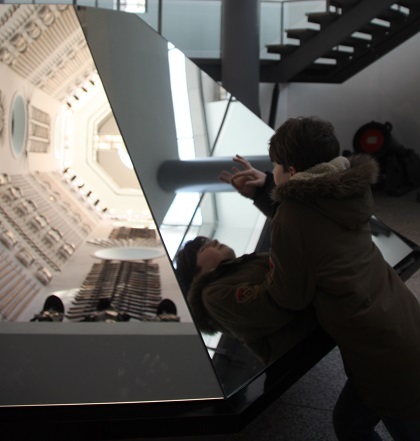 Mirrors are provided too so you don’t have to suffer too much neck ache when looking up. We decided to work our way through each gallery in turn. First was the War Gallery, the heart of the historical collection with lots of films, hands-on stuff and suits of armour just about everywhere. 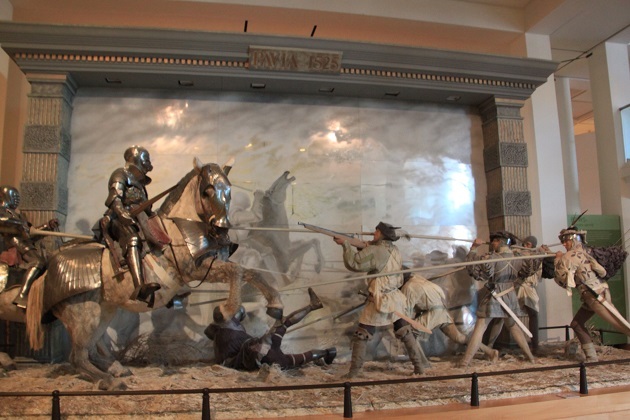 A few dioramas too, I liked that – very Night At The Museum. 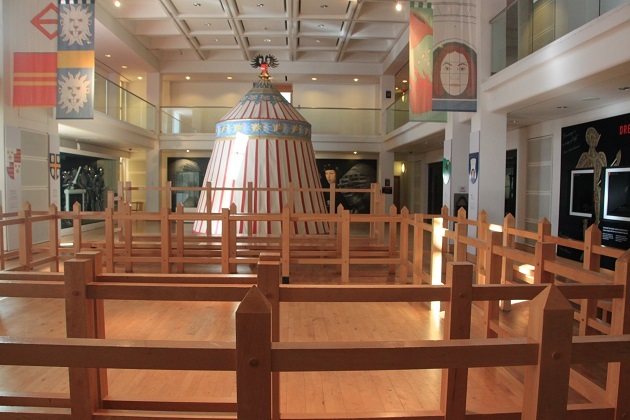 The Tournament Gallery had a replica tent intending to recreate the atmosphere of a jousting tournament. 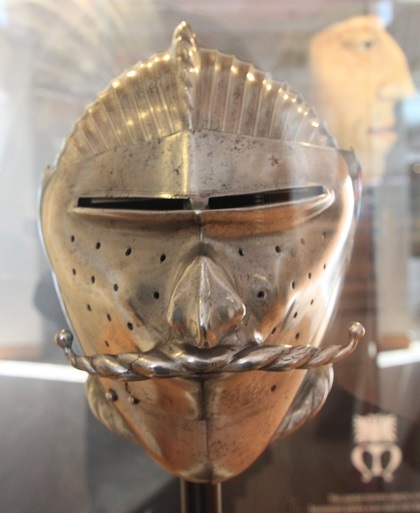 Everything here was related to armour made for sports and entertainment, they had Henry VIII’s horse armour and suits of armour for children – including one for a three year old. Son got stuck into the puzzles. They have a crossbow shooting range at the very top floor. Son was desperate to have a go, I must say it made me feel more than a bit weird and queasy to watch him and Husband shoot bolts at a target and I was glad when they were done. They loved it though – £3 for 8 bolts seemed like a reasonable deal. A quick explore in the Hunting Gallery and then we spent a long time in the Oriental Gallery. 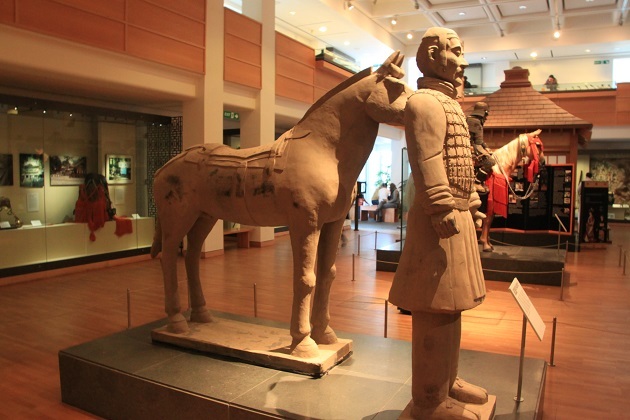 Lots of Asian weaponry and my most favourite thing of all – a replica Chinese terracotta warrior – Son and I were amazed at the size. We found daggers, swords and all sorts of other stuff used by civilians before the introduction of the police force. 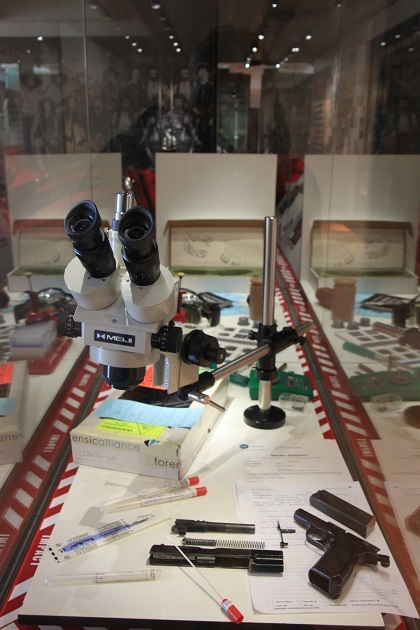 We saw weapons from famous films and had a look around forensic and crime scenes – sobering but interesting. Weapons and armour are not really my thing. War is definitely not my thing but we had a very absorbing afternoon in this museum which displayed armour and weapons through the ages but in no way glorified violence or war. Fascinating, so well laid out and a real talent here in the way they seek new ways to display this incredible collection and present these items in context and keep them alive. I love this and I love this place. 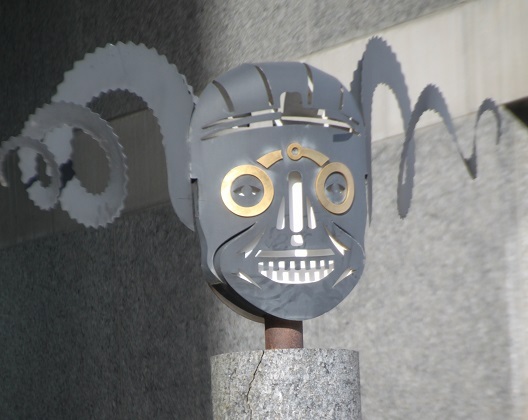 I worked on a bbc series called Handmade in Britain focussing on metalwork. 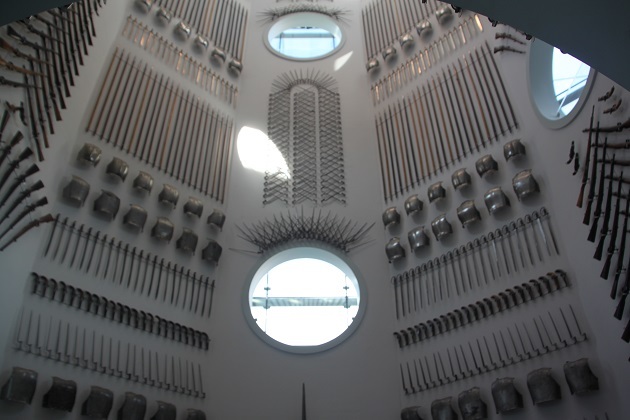 I focussed on silverware but i recced this armoury and sone fascinating London museums on behalf of a colleague. 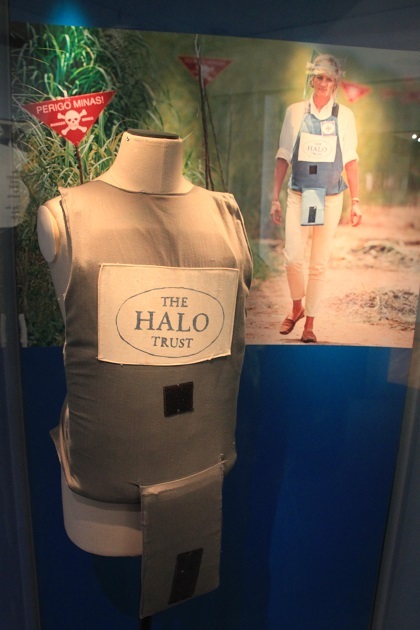 It was the fashion of its day yet used in battle. I really got into it. Glad you enjoyed your time there. 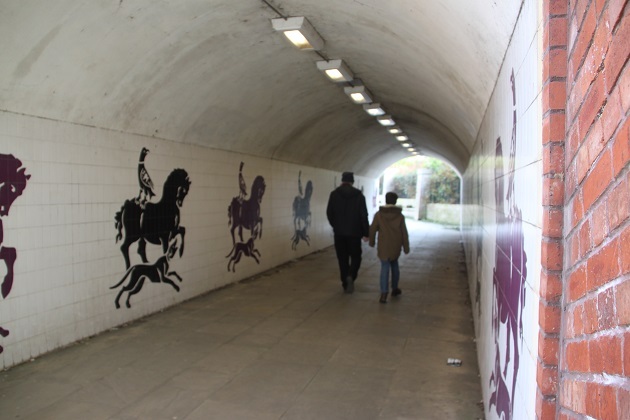 I wasn’t expecting to love it so much here – thought it would be a day out and a chance to escape from the house after being cooped up over Christmas!! 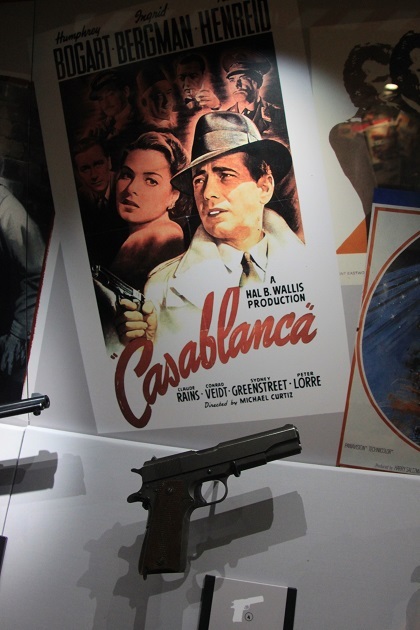 It was great, fascinating and so many different areas of weaponry on display, we loved it all. The coat, scarf, hat thing was a pain – lesson learnt for the future, try and not have too much “stuff” to carry around. 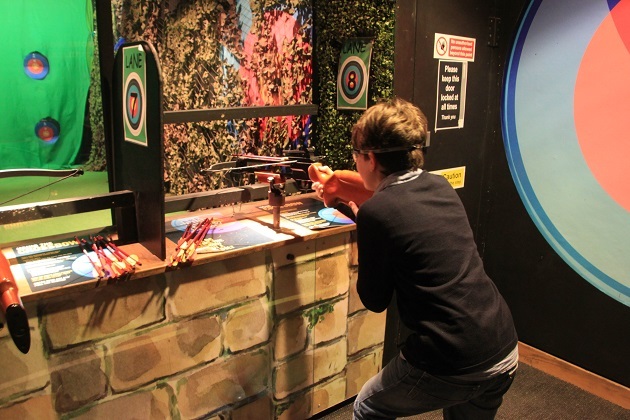 It is a great museum – so much to see and they loved that shooting range – I think our son could easily have stayed there all day! 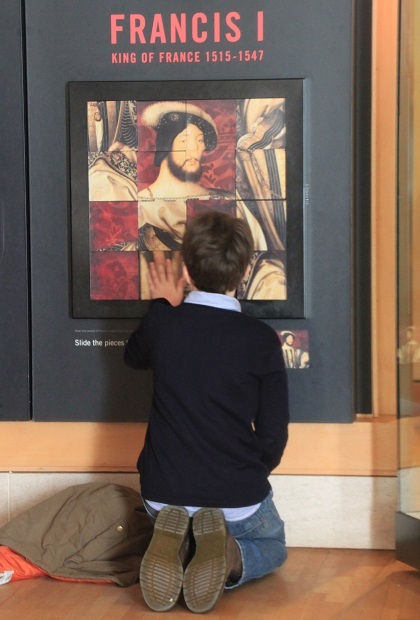 Your photos make me want to see this museum. I usually skip the armor and swords collections in museums — Baltimore, in fact, has a terrific collection at the Walters Museum — but this looks like a very modern take on all those old dusty swords and breastplates. Well done post! Thanks. I normally skip all the armour stuff too, swords and spears don’t really do it for me normally!! Here though I was really surprised, everything was displayed so creatively and with such originality – we all loved it!! Visited here when it first opened, it’s very interesting and remember viewing the outdoor displays so it’s a pity they have stopped. I remember friends of ours raving about the outdoor events so I regret missing out on that!! However we did really enjoy our day out here, who would have thought arms and armour could be so fascinating!! the Hall of Steel does look very impressive! It’s incredible – so artistic!! This looks so cool! I kind of want to shoot a crossbow. The Royal armory in Spain is so bland. Great photos! It is a great museum, definitely not bland, their displays and creativity is incredible. 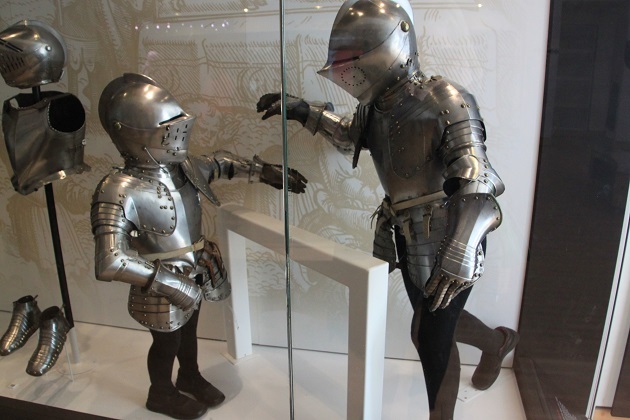 My favourite picture is the child sized suits of armour. I love the way they have arranged them as two wee guys having a chat! I can see why you were so impressed by the standard of the displays. 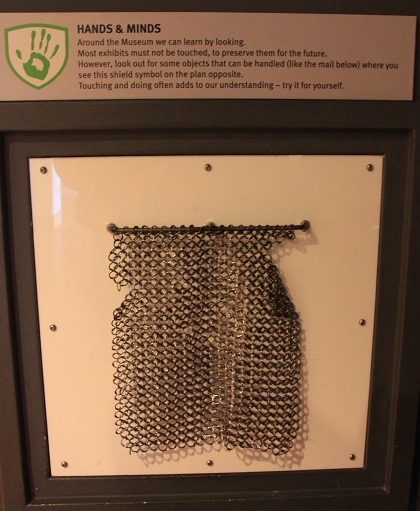 I loved that too – imagine though getting a 3 year old into that suit of armour!! I had enough trouble getting my son into his coat. The whole place was incredible, so impressive and just way beyond what I was expecting. Perhaps 3 year olds were more compliant in those days! 5 floors for free – sounds too good to be true! Let’s hope it can carry on at that price. Unbelievable that you can spend a day here with such fascinating and high quality exhibits for free. I remember when the museum was at the Tower of London before it was relocated. I went to Leeds some time ago, it is a good day out. One thing I don’t understand – having free museums is great but senseless when they have to cut back on exhibits or beg for contributions at the entrance. Why not just charge a sensible admission fee? Completely agree, I would have no problem paying admission to a place like this. I love a good museum and a free one is an extra bonus! Looks fascinating. My problem is I like to read everything and there is never enough time to do that! That was definitely a problem here Pam – five floors and so much to see meant we had to be selective with the reading. I also like to read everything but our son makes that a bit tricky sometimes although now he is older it is getting easier!! Your son must have gone crazy over this! Although I am from the UK, I have never been here, I think my girls would love it, some thing I need to make a note of to visit in the future, also just seems there is so much to do…the fact that it is free makes it more attractive, but I agree with Andrew above that to save any cut backs they should charge a reasonable fee to protect such an excellent museum. I am not into military history, arms or militaria either. However, as such things go, this seems to be a pretty col museum. I really like the look of the space and the way they have arranged the exhibits. That is exactly what I loved about it Laura, the way the place looked inside and the imagination used to display everything so effectively. That makes it all so great. What a fascinating place. Unfortunate that you had to carry coats throughout but so many things to keep you occupied. Shooting the bows looked interesting . I can see the fascination. The crossbow shooting was a real bit hit with the gentlemen in our family, I had to drag them away George!! In all the trips I’ve made to Leeds, I’ve yet to make it here. It looks like a really interesting museum though, I’ll have to check it out next time! It’s well worth a look – even if weapons and military history isn’t your bag, there’s still loads to see and do. It’s pretty sad when they can’t keep security lockers secure at an armory, but it looks like you had a great time in spite of having to carry your stuff around with you. I love the photo of the octagonal tower. What a great way to display the armor and weapons! Carrying a ton of coats, scarves etc. is hard going, our Son always seems somehow never to be carrying anything that belongs to him within about an hour of arriving somewhere yet we never notice how it has suddenly come our way!! It’s quite the skill….. that tower is just great, never seen weapons displayed like that before but I just loved it! That’s a shame for the locker. It happened to me once last year.. it’s always annoying to carry everything with you ! Carrying a load of stuff definitely doesn’t make for the best experience – especially when you have a son who seems to wriggle out of carrying what belongs to him!! Glad it wasn’t damaged here with the floods, we loved the whole collection and the museum. I think it’s open again now Rosemary after the floods, hopefully it didn’t suffer too much!! We’ve been talking about visiting for years – since our son was about 4 – and finally made it so don’t feel bad about not getting there!! I was so surprised at how much I did enjoy it, weapons and military stuff really aren’t my thing but there is so much here you would always find something that sparks an interest. We spent the whole day exploring and I would definitely go back again. We’re “enjoying” some much colder weather here at the moment Rosemary, that is better than the rain though, but we’re off to London for the weekend so hopefully we don’t get anything too severe. Hope your week was good too and your weekend is a fun filled one.